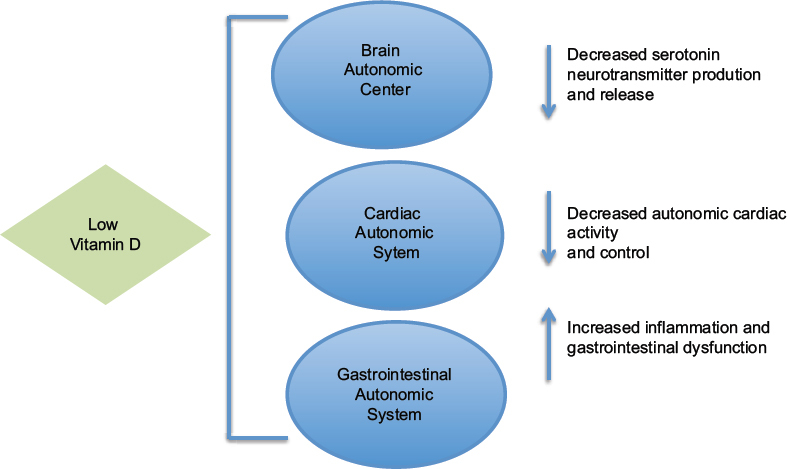 Dysautonomia, dysfunction of the autonomic nervous system, presents with heterogeneous clinical features from an imbalanced regulation of the sympathetic and parasympathetic nervous systems. Low Vitamin D levels can explain the heterogeneous clinical features of migraine headaches, cardiac and gastrointestinal dysfunction, and oxidative stress evident in dysautonomia patients. The role of Vitamin D in modulating pain sensitivity has been recently established. However, there is a lack of research and understanding regarding the association between Vitamin D deficiency and autonomic dysfunction. Vitamin D is a neuroactive hormone that modulates autonomic balance, regulating the sympathetic and parasympathetic nervous systems, and has multisystem benefits. The following review explores the literature and addresses the relationship between Vitamin D deficiency and autonomic dysfunction. Overall, this literature review implicates Vitamin D deficiency in autonomic dysfunction and elucidates the potential therapeutic role of Vitamin D in autonomic disorders. PubMed search was performed for English articles from 1996 to 2016. Following keywords: Vitamin D, autonomic dysfunction and orthostatic hypotension, Vitamin D receptor, migraine and traumatic brain injury, Vitamin D, cardiac and gastrointestinal disease, Vitamin D, glutathione, oxidative stress, and serotonin were included. Only articles reporting primary data relevant to the above question were included in the study. 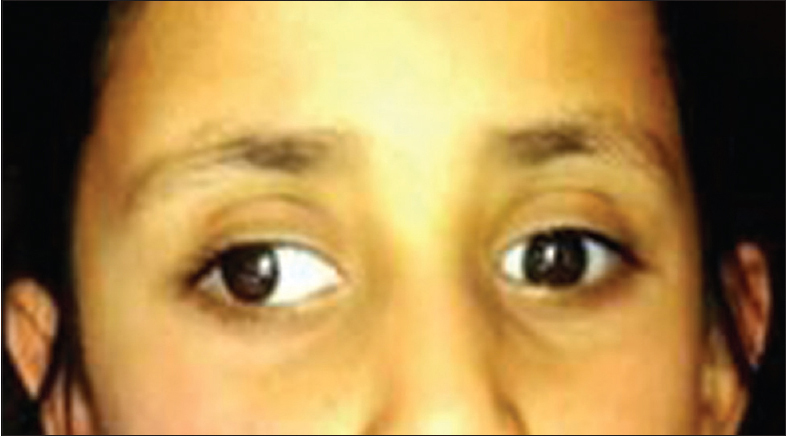 Intermittent distance exotropia is a deviation characterized by an exophoria at near fixation and manifest exotropia at distance fixation. There is normal binocular fusional vergence and stereoacuity at near fixation, but the eyes tend to diverge in bright sunlight, tiredness, day dreaming and the patient may close one eye in such circumstances. Prematurity is associated with numerous eye pathology, besides retinopathy of prematurity, amblyopia, refractive errors, it is also associated with a higher risk esotropia and exotropia. We report a case of a 5-year-old girl (preterm and very low birth weight) with an intermittent deviation of both eyes since three years. On her detailed ocular examination diagnosis of divergence excess intermittent exotropia with normal accommodative convergence to accommodation ratio was made. Bilateral lateral rectus recession was done using hang back technique. Postoperatively, the eyes were aligned normally thereby achieving orthotropia. This article reviews various neurophysiological aspects of intermittent divergent squint delineating the etiopathogenesis, classification system, and management options in intermittent exotropia. Autoimmune (antibody mediated) encephalitis (AE) is emerging as a more common cause of pediatric encephalopathy than previously thought. The autoimmune process may be triggered by an infection, vaccine, or occult neoplasm. In the latter case, onconeural autoantibodies are directed against intracellular neuronal antigens, but a recent heterogeneous group of encephalitic syndromes has been found not to have underlying tumor but is associated with autoantibodies to the neuronal surface or synaptic antigens. Neuropsychiatric symptoms are very common in autoimmune encephalopathy; as a result, affected children may be initially present to psychiatrists. Neurological features are movement disorders, seizures, altered conscious level, and cognitive regression. Hypoventilation and autonomic features may be an aspect. Inflammatory findings in the cerebrospinal fluid may be present but are relatively nonspecific. Magnetic resonance imaging (MRI) may also demonstrate abnormalities that provide clues for diagnosis, particularly on fluid-attenuated inversion recovery or T2-weighted images. AE is well responsive to immune therapy, with prompt diagnosis and treatment strongly beneficial. Patients with paraneoplastic encephalitis are more refractory to treatment compared to those in whom no malignancy is identified. Herein, the authors present an update of literature data on the clinical presentation, laboratory and imaging findings, therapy, and outcomes for the most common autoimmune encephalitides. Background: Weight gain is a common adverse effect of sodium valproic acid (VPA) in children with epilepsy. Several mechanisms of VPA-induced obesity have been suggested such as increased appetite, facultative thermogenesis, and elevated insulin and leptin levels. In this study, we aimed to investigate the role of Insulin and Leptin in the pathogenesis of weight gain caused by VPA. Materials and Methods: Body mass index (BMI) was calculated, and serum insulin and leptin levels were measured in 45 consecutive patients and 45 controls. Results: The mean BMI of the cases and control group was 22.97 kg/m2 and 19.4 kg/m2, respectively, and it was significantly higher in cases (P < 0.001). 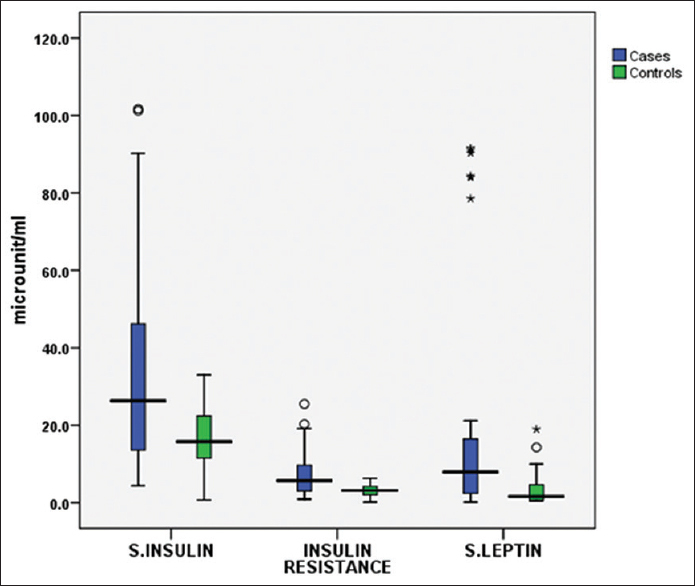 Fasting serum insulin levels were higher in VPA group (26.3 μU/ml) than in controls (15.83 μU/ml), which was statistically significant (P < 0.001). Serum leptin levels were also found to be elevated significantly in VPA group (7.9 ng/ml) than in controls (1.6 ng/ml). Conclusion: Sodium VPA is associated with significant rise of BMI, hyperinsulinemia, raised insulin resistance, and increased leptin levels in children with epilepsy. Objective: The aim of this study is to assess bone mineral status in children with epilepsy, on different antiepileptic drugs (AEDs) regimen, using dual-energy X-ray absorptiometry (DXA) and routine biochemical bone markers. Patients and Methods: This is observational prospective controlled cohort study, conducted at Mansoura University Children Hospital, from January 2014 to June 2015. In this study, we had 152 participants with ages 3–13 years, 70 children diagnosed with epilepsy and 82 were controls. Children classified into two groups according to the duration of treatment, Group 1 children maintained on AEDs for 6–24 months, Group 2 children ≥24 months. Bone mineral density (BMD) measured by DXA and biochemical markers includes serum calcium, phosphorus, alkaline phosphatase (ALP), and parathyroid hormone (PTH). Results: In this study, we found that the serum level of calcium and phosphate were significantly low (P > 0.05) in total cases versus control. We found that the serum level of and ALP and PTH were significantly high (P > 0.05) in total cases versus control. Regarding the DXA markers, there was a significant decrease of BMD and Z-score for the total body and lumbar area in the total cases versus control (P > 0.05). Conclusion: The present study showed that all AEDs (new and old) affect bone mineral status in children receiving therapy for more than 6 months, altering both biochemical markers (serum calcium, phosphorus, ALP, and PTH) and radiologic markers (BMD assessed using DXA). Children on AEDs for a longer duration (≥2 years) showed more severe side effects on BMD. Children receiving multiple AEDs are more prone to altered bone mineral status, especially with long duration of therapy. The study also highlights the role of DXA as a safe noninvasive method to assess BMD in children on long-term AEDs. Introduction: Traumatic injuries are the leading cause of death and a major cause of disability among children. About 70%–80% of the accidental deaths in pediatric age group result directly from central nervous system lesions. Methods: The purpose of our study was to study all the patients of ≤18 years of age with head or spinal injury admitted in neurointensive care unit at our center, an apex trauma center in a developing country, between June 2009 and September 2011. We retrospectively analyzed various factors including type of injury, mode of injury, admission Glasgow coma score (in case of head injury), and mortality rate. Observations: The study population consisted of 264 injured children. Mean age was 8.3 ± 5.6 years (range 5 months to 18 years). 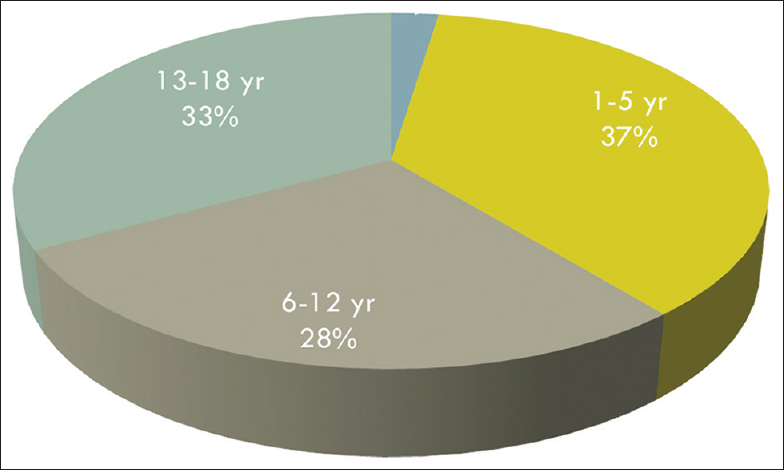 Forty percent of patients were within 1–5-year age group. Head injury accounted for 89% of cases and 11% of cases were spinal injury patients. Low-velocity trauma was the most common mode of injury, accounting for 74% of the cases. The percentage of patients with mild, moderate, and severe head injury were 38%, 15%, and 47%, respectively, in the head injury group. Mortality in head injury patients was 18% and in spinal injury patients was 9%. Operative intervention was done in 56% of patients. Predictors of mortality included severe head injury, hospital stay <7 days, pneumothorax, the presence of hypotension, and deranged coagulation parameters. Conclusions: Head injury is much more common than spinal injury in pediatric patients and fall from height being the most common mode of injury. Severe head injury, hospital stay <7 days, pneumothorax, presence of hypotension, and deranged coagulation parameters are predictors of poor outcome. Chordomas are primary malignant bone tumors that arise in the axial skeleton, believed to originate from remnants of embryologic notochordal cell rests. Multicentric origin of chordoma is extremely rare. To our literature search, we found only three cases of multicentric chordoma in adults. We report a first case of multicentric chordoma in pediatric age group. A 14-month-old child presented with torticolis and left upper limb monoparesis, imaging showed expansile bony destructive lesion in clivus and dorsal spine simultaneously. The child underwent laminectomy, decompression of cord, excision of lesion, and histopathology was suggestive of chordoma. Pediatric chordomas are aggressive tumors, require multidisciplinary management with maximal safe resection followed by radiotherapy (conventional and/or proton). Even with multidisciplinary management, pediatric chordomas have high morbidity and mortality. Subdural-peritoneal (SP) shunting is a simple procedure to treat subdural hygromas; however, several rare complications such as shunt migration exist. 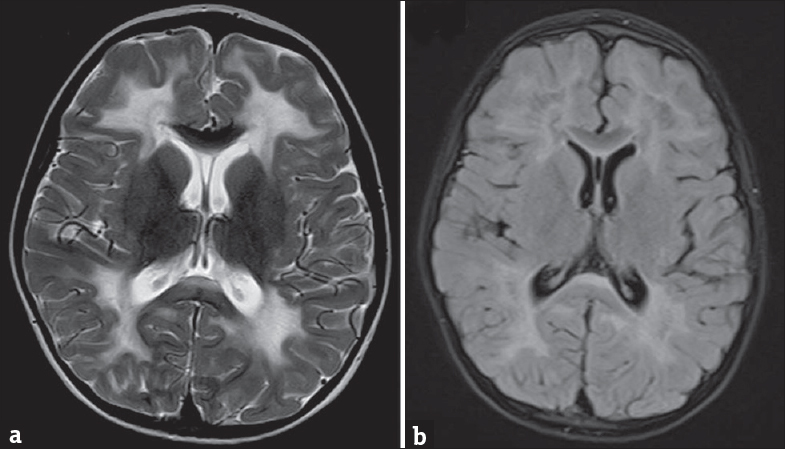 A 15-year-old boy presented with headache, nausea, and vomiting , and underwent SP shunting for left frontoparietal chronic subdural effusion. Six weeks later, radiographic examinations revealed total migration of the shunt through the pelvic inlet. The migrated shunt was replaced with a new SP shunt. Four weeks later, radiographic examinations revealed shunt migration into the subdural space. The shunt catheter was removed and the subdural effusion was evacuated. Shunt migration may result from pressure differences between the abdomen and the cranium or from head movement, and insufficient fixation and/or large burr holes can facilitate shunt migration. Double firm anchoring and small-sized burr holes can prevent this complication. SP shunt is a simple procedure, and its assumed complications can be prevented through precaution. 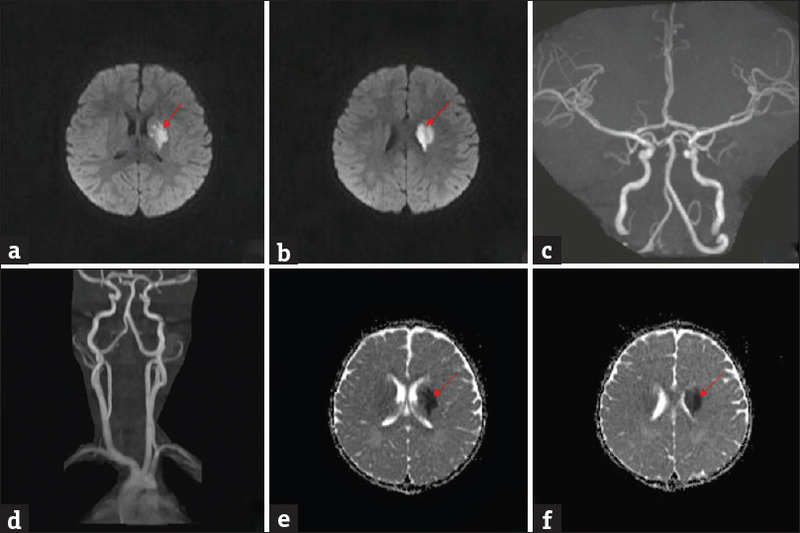 Acute necrotizing encephalopathy of childhood (ANEC) is a rare condition mainly affecting children with a distinct clinico-radiologic pattern. Initially thought to be secondary to respiratory viral infections, there have been more insights to the pathogenesis of ANEC including genetics. We present a case of a girl who developed this condition with classical clinico-radiologic findings of ANEC secondary to severe dengue infection and could not survive. We report this case with the aim to raise awareness about this fatal complication of dengue infection as dengue has become a global health-care problem. Rosette-forming glioneuronal tumor (RGNT) is a rare variety of slow growing mixed glioneuronal tumor involving primarily fourth ventricular region and occurring predominantly in young adults. 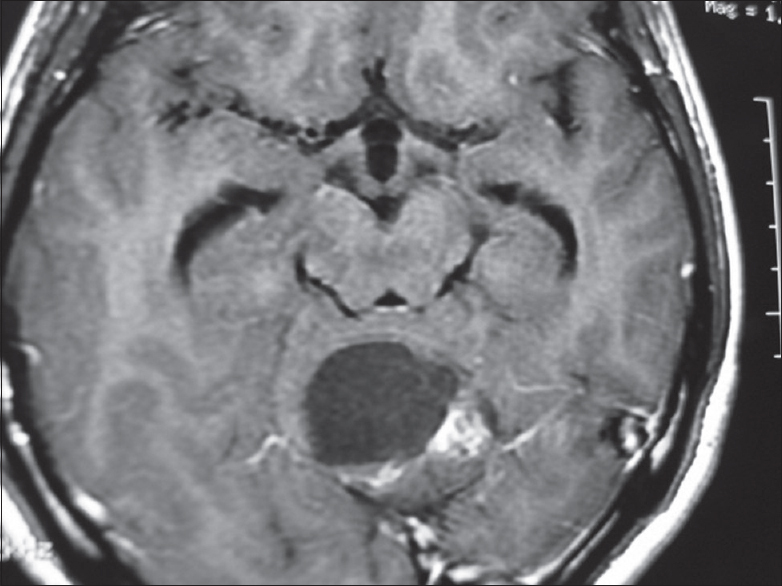 We present a case of a 16-year-old boy who presented with dizziness and occipital headache. On radiological evaluation, a fairly large hypodense posterior fossa mass lesion in relation to the left side of the vermis, with a large cystic component was found. Surgical resection of the tumor was performed. Histopathological examination showed a biphasic tumor composed of bland neurocytic cells, arranged in the form of neurocytic rosettes along with glial areas resembling low-grade glioma. The neurocytic rich region shows strong synaptophysin positivity in the neuropil-rich core of the rosettes. Methylation-inhibited binding proliferative index was low (<1%). Based on these features, a diagnosis of RGNT was made. RGNT of the fourth ventricle should be considered in differential diagnosis of posterior fossa lesions, especially in relation to fourth ventricle and vermis in young adults. 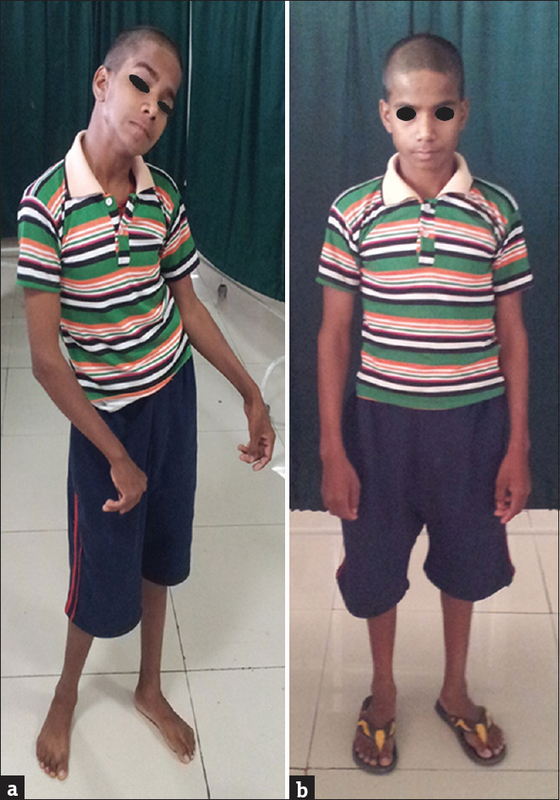 Dopa-responsive dystonia also known as “Segawa's syndrome” was first described in 1976. The dystonia typically shows diurnal variations and is more marked toward the end of the day and improves in sleep. This entity is often misdiagnosed in the clinical setting, mostly due to the lack of awareness, and these patients are exposed to various treatment regimens and nonpharmacological measures. We present a boy being treated as dystonic cerebral palsy who showed significant improvement in dystonic symptoms with L-dopa therapy. Ovarian germ cell tumors (GCTs) are rare and affect mainly young girls and women. Two histological groups are distinguished: dysgerminomas and nondysgerminomatous tumors. These tumors have initial good responses to surgery and chemotherapy in 80% cases, but >75% of patients die due to complications of disease progression. There are very few case reports of mixed GCT with extradural spine metastases. 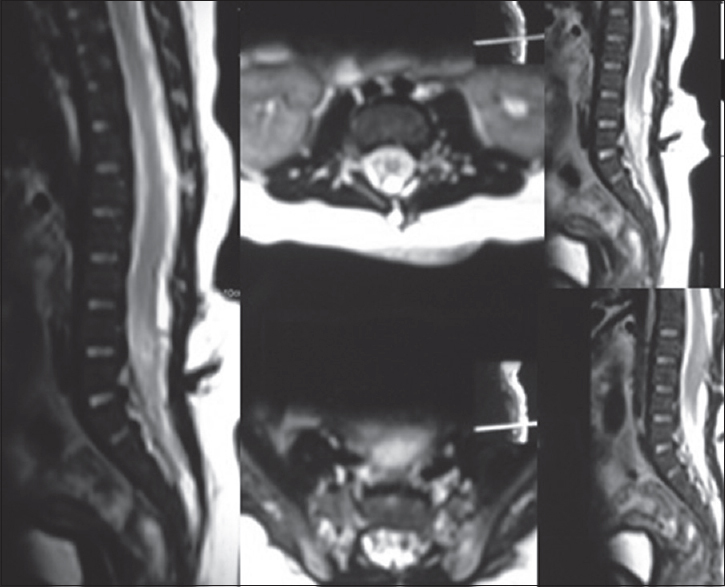 We report a rare case of a 17-year-old girl who had undergone left salpingo-oophorectomy with omental and peritoneal biopsy for ovarian GCT with extradural spinal metastasis. 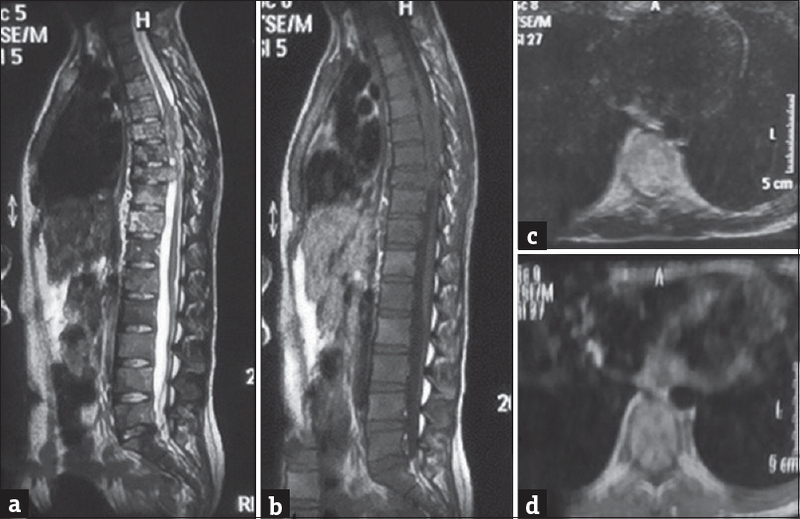 Split notochord syndrome represents an extremely rare and pleomorphic form of spinal dysraphism characterized by a persistent communication between the endoderm and the ectoderm, resulting in splitting or deviation of the notochord. It manifests as a cleft in the dorsal midline of the body through which intestinal loops are exteriorized and even myelomeningoceles or teratomas may occur at the site. A rare variant was diagnosed on autopsy of a 23+4-week-old fetus showing a similar dorsal enteric fistula and midline protruding intestinal loops in thoracolumbar region. The anteroposterior radiograph showed a complete midline cleft in the vertebral bodies from T11to L5region, and a split in the spinal cord was further confirmed by ultrasonography. Myelomeningocele was erroneously reported on antenatal ultrasound. Thus, awareness of this rare anomaly is necessary to thoroughly evaluate the cases of such spinal defects or suspected myelomeningoceles. The Central nervous system can be affected in extrapulmonary tuberculosis. The intracranial tuberculoma occurrence is a rare entity occurrence; most often occur in the form of discrete small multiple lesions. Rarely a large sized tuberculoma is observed with mass effects and usually managed surgically to provide rapid relief of mass effect, histopathological confirmation of diagnosis, reduction of pathological mass thereby increasing efficacy of medical therapy. 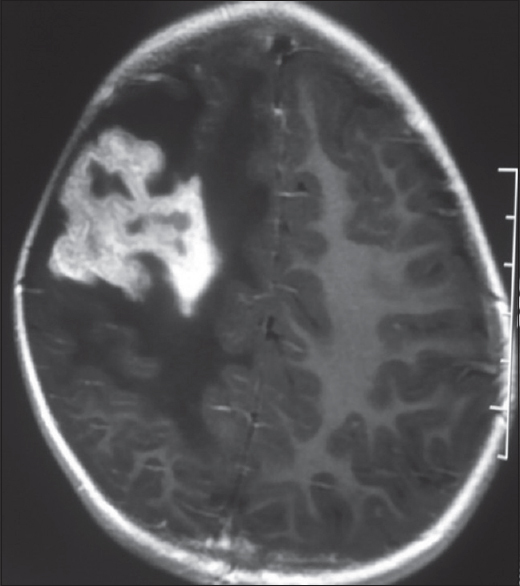 Author reports an extremely rare case of giant tuberculoma occurring in a pediatric patient, which was managed with antituberculous medication along with cerebral decongestant. The patient was also advised surgical therapy in view of giant size of tuberculoma associated with significant mass effect; however, the parents were unwilling for any form of surgical intervention and finally choose to continue medical treatment alone. After 6 months of antitubercular medical therapy, magnetic resonance imaging brain showed completely vanishing of lesion and also amelioration of mass effect with marked subsidence of perilesional edema correlated very well with marked improvement in the clinical status. He received antituberculous therapy for 24 months. 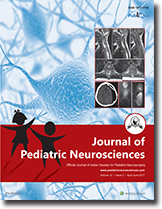 To the best knowledge of authors, the current case represents first case of its kind in the pediatric age group with giant intracerebral tuberculoma responding favorably with medication. Management of such rare case and pertinent literature is reviewed briefly. Intracranial aneurysm is a rare cause of seizure although few cases may develop new onset seizure following rupture of aneurysm. The causes of seizure in ruptured aneurysm may be caused due to presence of subarachnoid hemorrhage, intracerebral hematoma, infarct due to progressive vasospasm, worsening of hydrocephalus, or even after surgical craniotomy for clipping of aneurysm. However, incidental aneurysm solely presenting with complex partial seizure is not reported in literature. To the best of knowledge of authors, current case represents the first case as incidental aneurysm presenting with seizure and pertinent literature is briefly reviewed. Inflammatory myofibroblastic tumor (IMT) is a rare tumor in the central nervous system (CNS), mostly being extracranial. Approximately 100 sporadic cases have been reported in the literature. The rarity of the tumor, its various histopathological characteristics, and its variable aggressive course render it difficult to diagnose and treat. IMT is generally a histological diagnosis which is rarely suspected preoperatively. It mimics other intracranial tumors such as giant cell tumor, hemangiopericytoma, anaplastic meningioma, plasmacytoma, and lymphoma. 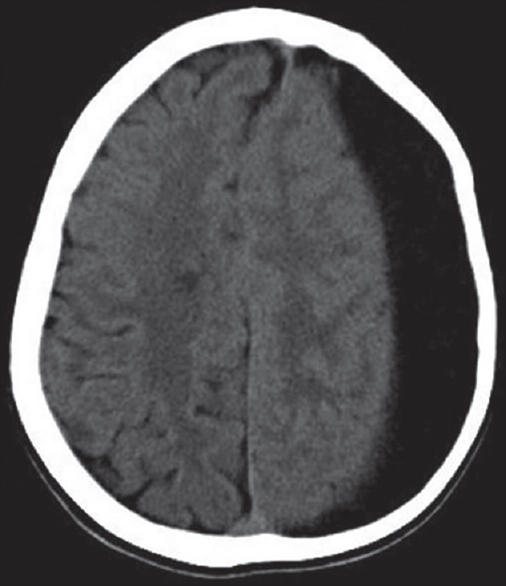 Rarely, it can present with a clinical picture which mimics a benign infective process, Rosai-Dorfman disease, or an idiopathic hypertrophic pachymeningitis. High index of suspicion is required as total resection of this lesion is mandatory to prevent recurrence. 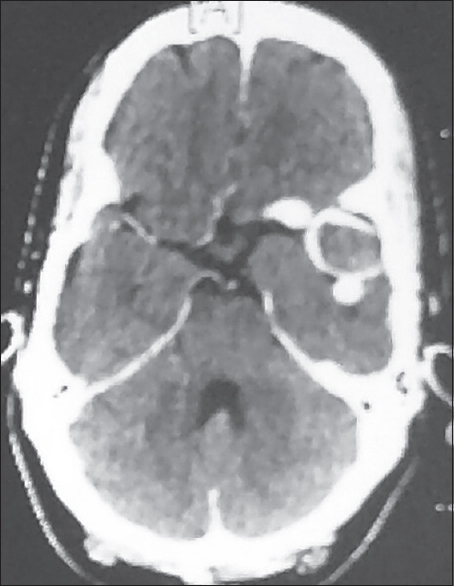 Here, we describe a case of a 10-year-old child which initially presented with clinical features mimicking chronic suppurative otitis media and radiological presentation of a small intracranial abscess. He was initially treated by an ENT surgeon who started him on intravenous antibiotics, but the patient was lost to follow up. He returned after 2 months with a large lesion at the same location. Histological examination revealed multiple spindle cells with plasma cells and lymphocytes scattered among these spindle cells. The spindle cells were immunopositive for smooth muscle actin and negative for epithelial membrane antigen, S100, and CD34. Teratomas are one of the most common tumors in newborn with excellent prognosis arises from totipotent primordial germ cells harboring two or three germ cell layers. The tumor has been titled “Great masquerade.” The teratomas of sacrococcygeal region present with lower limb weakness, urinary or bowel obstruction, and swelling at lower back or intrauterine mass in ultrasound or complicated delivery. A 2-month-old male child presented with complaints of swelling over lumbosacral region with discharging punctum since birth. Sagittal T2-weighted magnetic resonance imaging (MRI) of the spine showed myelocele at L5 level forming placode with central defect at L4-S1 and low-lying tethered cord up to L4–L5. The patient was operated, and histopathology surprisingly came to be mature teratoma. We followed the patient with serum beta human chorionic gonadotropin and alpha-fetoprotein markers and MRI. Literature supports complete surgical removal, including coccyx and tumor base. Mature teratoma is considered as benign disease thus even subtotal excision is appropriate but with aggressive follow-up. The difference in recurrence following total compared to subtotal resection is considered insignificant. In this article, we have discussed the management of teratoma in detail. Teratoma with meningomyelocele is a rare entity. There is still dilemma in managing cases and prognosticating parents in such patients. The provisional diagnosis of teratoma should also be considered when child presents as midline sacrococcygeal mass. 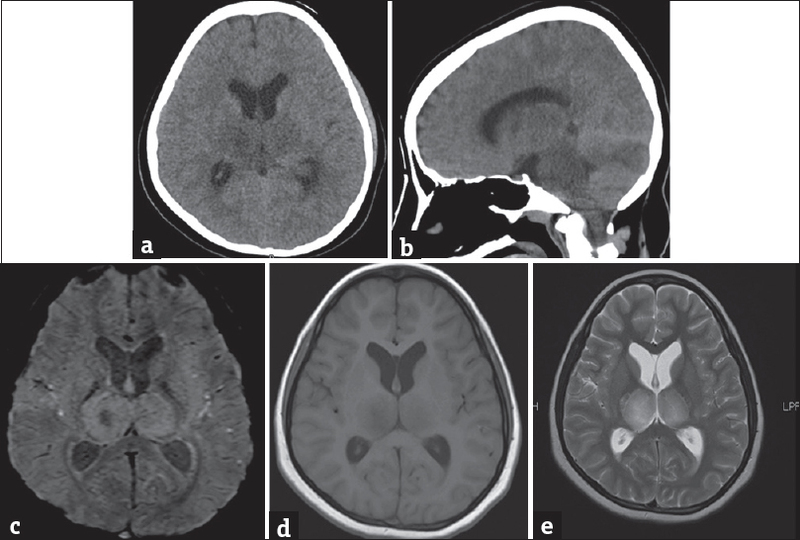 A 4-year-old boy presented with loss of motor milestones following viral fever. On examination, the child had increased tone and exaggerated deep tendon reflexes. Magnetic resonance imaging of the brain showed white matter hyperintensities on T2-weighted images, which revealed partial inversion on fluid-attenuated inversion recovery images. Clinical exome sequencing revealed a novel homozygous mutation c.1270T>G: pCys424Gly in exon 11 of the EIF2B3 gene. This novel mutation is reported in this article along with a literature review. 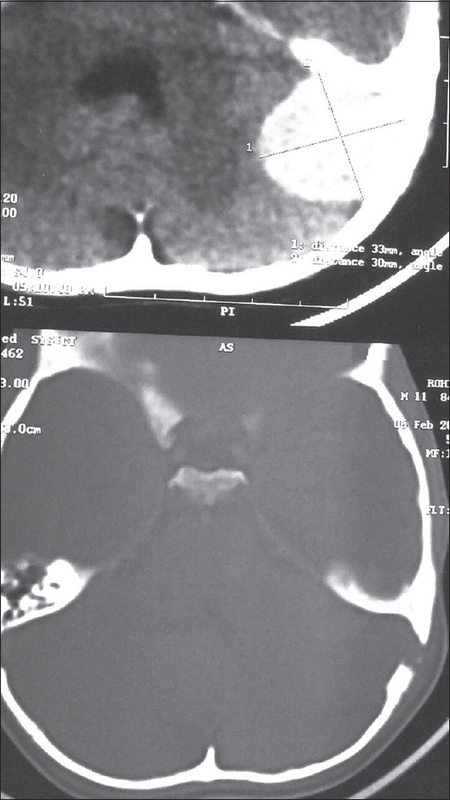 We report a case of surgical management of Crouzon syndrome with multisuture craniosynostosis presenting with increased intracranial pressure (ICP) manifesting with chronic papilledema without ventriculomegaly. 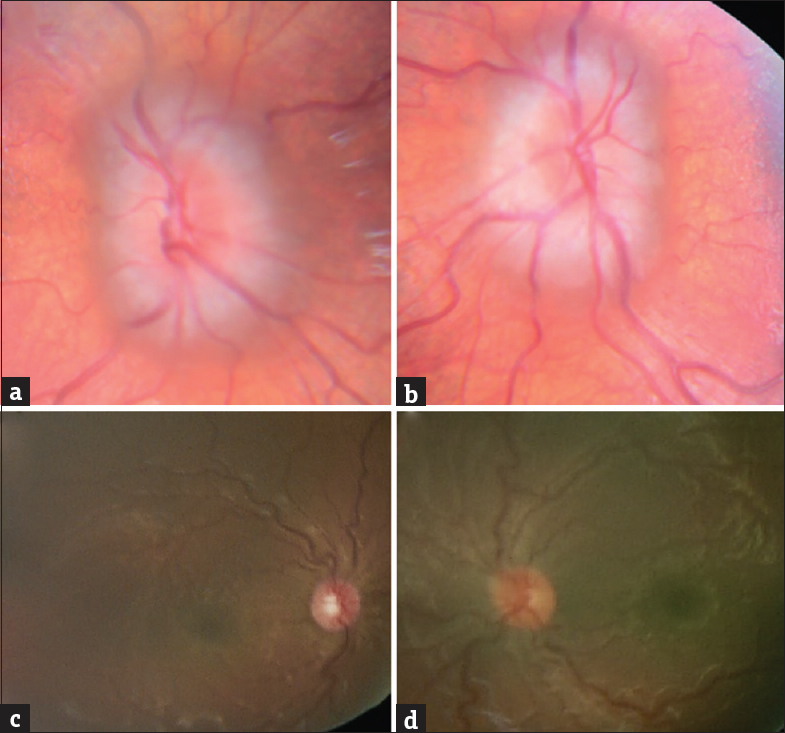 A 12-month-old boy had complete resolution of papilledema after posterior cranial vault distraction followed by staged fronto-orbital advancement. 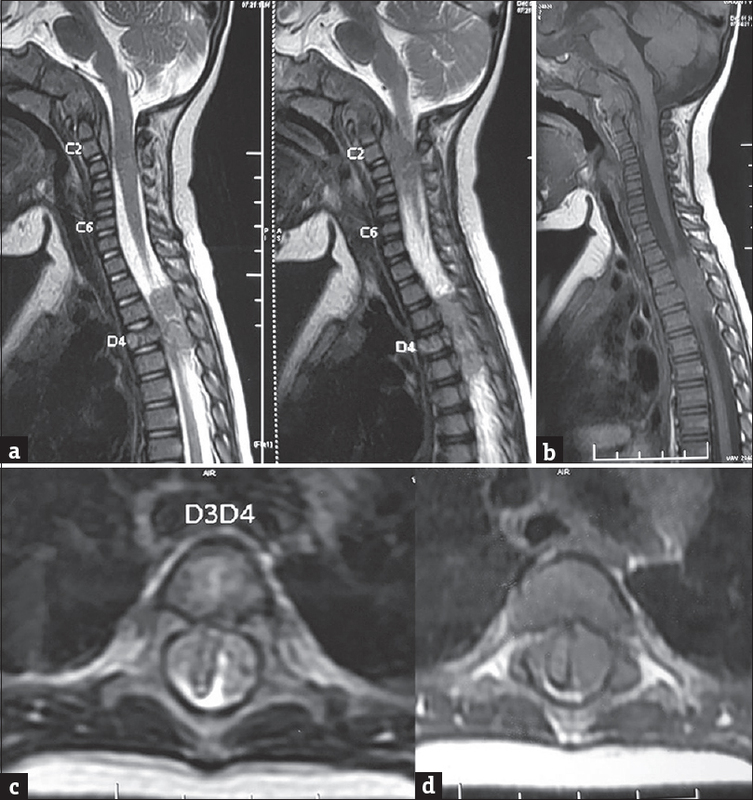 Expansion of the cranial vault with posterior distraction osteogenesis posed an elegant treatment, obviating ventriculoperitoneal shunt placement for cerebrospinal fluid (CSF) diversion. Strategies for the management of elevated ICP without ventriculomegaly in craniosynostosis include CSF shunting and cranial vault expansion. Posterior calvarial vault distraction associated with resolved papilledema has not been previously reported. Addressing the craniocephalic disproportion for this child with chronic papilledema, without ventriculomegaly, allowed the possibility of shunt freedom. Epilepsia partialis continua (EPC) is a form of focal status epilepticus often refractory to anticonvulsant therapy. A wide range of abnormalities such as inflammatory, vascular, metabolic-toxic, developmental malformations, and neoplasia cause EPC. 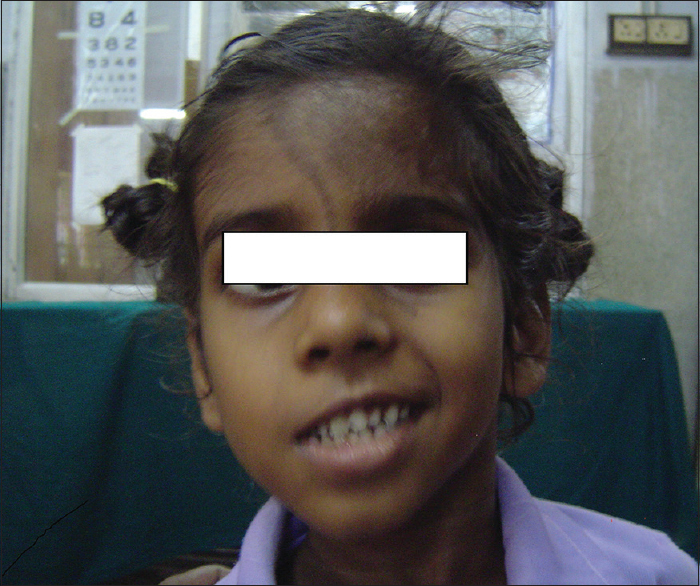 Linear nevus syndrome with hemimegalencephaly is one of the developmental malformations that can present with EPC.